That Old House @ Blalock property approximately 30 minutes south of downtown Raleigh, address included in registration confirmation. 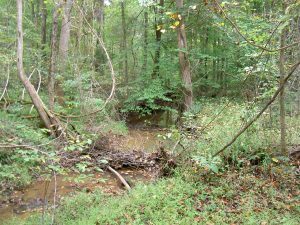 The Blalock property in Wake County 30 minutes south of Raleigh is home to beautiful streams, forests, and an old house that would be a great environmental education center! Unfortunately the house was abandoned with many old belongings left inside and has fallen into disrepair. In order to give it new purpose we need your help to clean out the things left behind and make way for new plans! Join us and the Raleigh Midtown Rotary Club on August 25th for a summer cleaning day! Roll up your sleeves to help us remove old books, furniture, magazines and more from the house and give it new life. 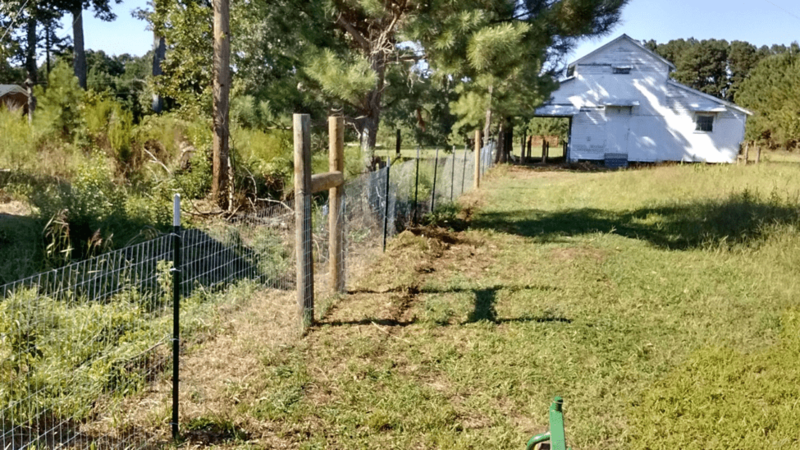 This property is not open to the public, the exact address will be included in your registration confirmation email, it is located about 30 minutes south of downtown Raleigh. Please register below so we know how many to expect and can send you further details. **The house has been vacant for several years, though we will provide masks this task is probably not suitable for those with severe allergies. The Haw River Assembly is bringing the nationally recognized Wild & Scenic Film Festival to Carrboro! Join us for a night of environmental and adventure films that depict the beauty of the natural world, the challenges facing our planet, and the work communities are doing to protect the environment. The films inspire activism and call us all to protect the places we love. *Please note that some films may not be suitable for children. Doors open at 6:30pm, and films start promptly at 7pm. Come early to visit with friends and check out the work of partner organizations like Triangle Land Conservancy and Friends of Bolin Creek! Free appetizers provided. Beer and Wine available for purchase from Steel String Brewery. Kombucha and other non-alcoholic fermented beverages for purchase from Boro Beverage. Partial proceeds benefit the Haw River Assembly! Purchase raffle tickets to win prizes from Haw River Canoe & Kayak, Great Outdoor Provision Company, Cameron’s and more. Please join us at our next meeting of the Walnut Hill Advisory Committee. A team from Regenerative Design Group will be presenting preliminary ideas for an Agricultural Concept Plan for Walnut Hill. The presentation will take about 45 minutes, followed by discussion and feedback on September 20th from 3-5 PM. Come hear their plans for the preserve during a formal presentation at Good Hope Baptist Church on September 20th. Food and refreshments provided. 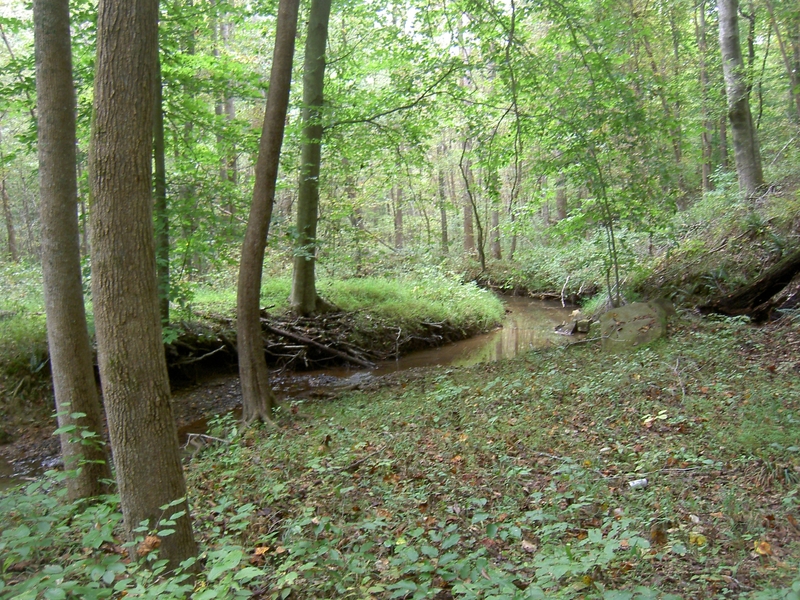 In addition to its agricultural and historical significance, Walnut Hill Farm contains contiguous, unfragmented forests as well as several streams that drain into Marks Creek and the Neuse River. 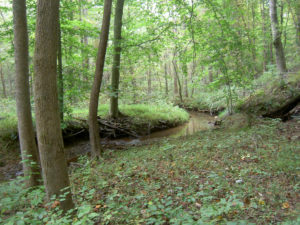 The property is also adjacent to the Riverwalk conservation tract to the south, which is owned by the State and under a stewardship management agreement with the Town of Clayton. The Riverwalk tract links Walnut Hill Farm to the Neuse River and the Neuse River Greenway, segments of the Mountains-to-Sea Trail. Please register below so we know how many to expect. 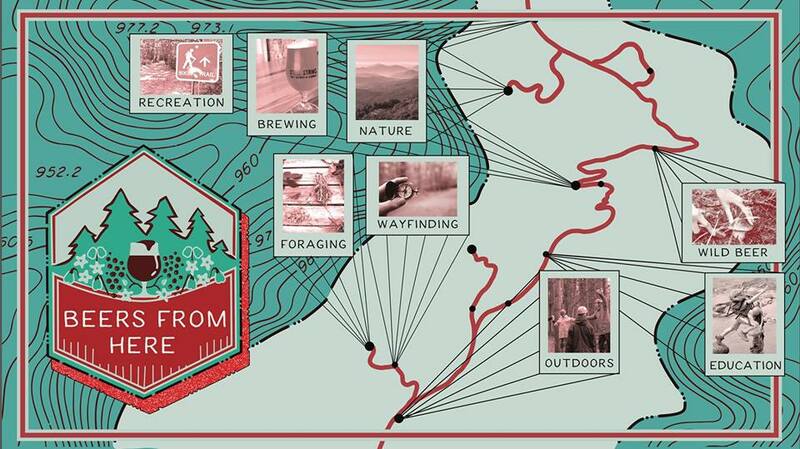 Beers From Here – A collaboration between local beverage producers and Triangle Land Conservancy to celebrate the lands behind local flavor. Each participant will lead exploratory foraging walks through nearby TLC nature preserves and produce a unique beverage inspired by and utilizing some ingredients collected during the walk. On September 23rd join Starpoint Brewing, Durty Bull Brewing Company, and Fullsteam Brewery on a wild edibles exploration walk. 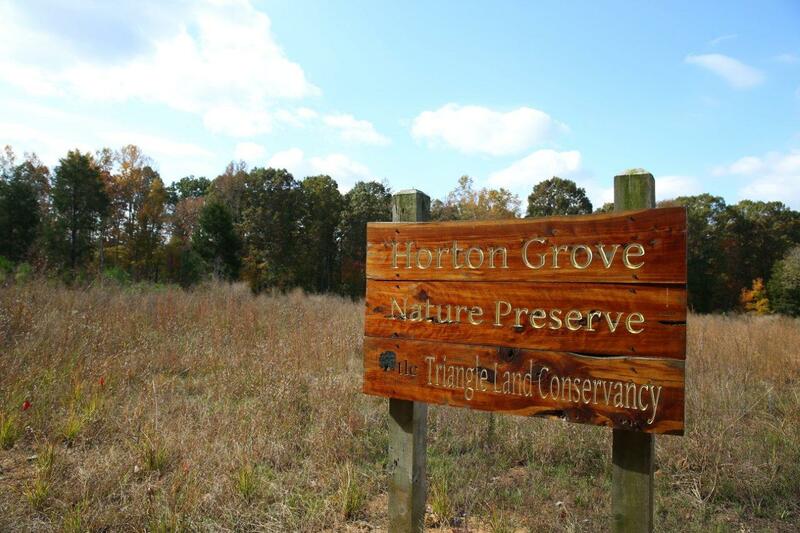 Opened in 2012, Horton Grove Nature Preserve is Triangle Land Conservancy’s largest public preserve with 708 acres. Visitors can currently enjoy approximately eight miles of trail, including the That Makes Sense Interpretative Trail for kids These trails wind through mature forests, including upland oak-hickory forests, beech slopes, and several stands of mixed pine and hardwoods. TLC has restored two small native plant meadows here, including a 20-acre warm season grassland surrounding the main parking area. **Please note, foraging is only permitted on TLC properties under special circumstances and supervision of TLC staff. This event is free but space is limited so please register below in order to participate. 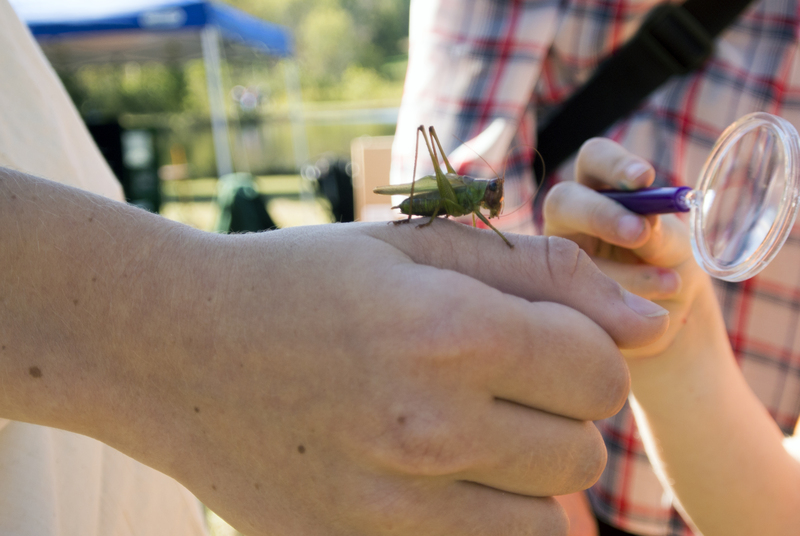 The North Carolina Entomological Society has teamed up with Triangle Land Conservancy to host the Brumley Bug Bioblitz on the afternoon of September 29, 2018. We hope to document as many insects, spiders, and other arthropods as possible and upload the photos to iNaturalist where they can be shared with scientists and naturalists. Anyone hiking at Brumley Nature Preserve this afternoon is welcome to photograph and submit bug photos to the Brumley Bug Bioblitz project on iNaturalist. For those who want a chance to explore the preserve’s diversity of insects more thoroughly, we are offering three structured events guided by the NCES. These events are free, but pre-registration is required. Please register below for the Sweep Net and Beat Sheet hike. Get a chance catch bugs like a real entomologist! We will use sweep nets and beat sheets to sample insects on plants. After photographing them, we will release them back into the wild. Bring your phone or camera to help take photos. Insect nets and beat sheets will be provided. The North Carolina Entomological Society has teamed up with Triangle Land Conservancy to host the Brumley Bug Bioblitz on the afternoon of September 29, 2018. We hope to document as many insects, spiders, and other arthropods as possible and upload the photos to iNaturalist where they can be shared with scientists and naturalists. Anyone hiking at Brumley Nature Preserve this afternoon is welcome to photograph and submit bug photos to the Brumley Bug Bioblitz project on iNaturalist. 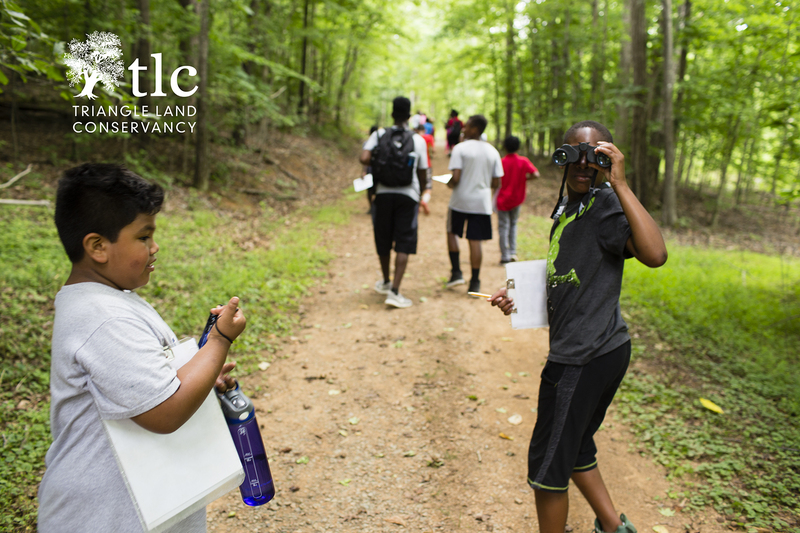 For those who want a chance to explore the preserve’s diversity of insects more thoroughly, we are offering three structured events guided by the NCES. These events are free, but pre-registration is required please register below for the coverboard and pitfall trap hike at 3:30 PM. Get a peek at the hidden world of ground dwelling insects. During this hike we will photograph live insects collected in pitfall traps or under cover boards, then release them back into the wild. Bring your phone or camera to help take photos. Who knows what amazing critters we might discover? The North Carolina Entomological Society has teamed up with Triangle Land Conservancy to host the Brumley Bug Bioblitz on the afternoon of September 29, 2018. We hope to document as many insects, spiders, and other arthropods as possible and upload the photos to iNaturalist where they can be shared with scientists and naturalists. Anyone hiking at Brumley Nature Preserve this afternoon is welcome to photograph and submit bug photos to the Brumley Bug Bioblitz project on iNaturalist. For those who want a chance to explore the preserve’s diversity of insects more thoroughly, we are offering three structured events guided by the NCES. These events are free, but pre-registration is required. 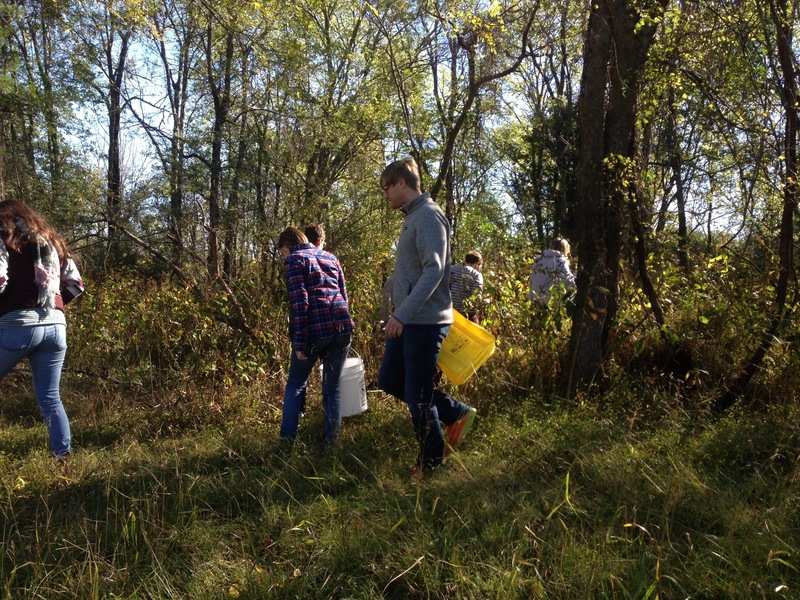 Please register below for the coverboard and pitfall trap hike at 3:30 PM. Normally, the Brumley Nature Preserve is closed after dark, but not tonight! Come discover the mysterious world of night-flying insects. We will photograph as many insects as we can at various insect-attracting light traps. Bring a camera, a headlamp or flashlight, and plenty of curiosity. On September 30th join Trophy Brewing, Botanist and Barrel, and Steel String Brewery as we explore the wild edibles of Walnut Hill Nature Preserve. This property is not yet open to the public so this is a rare chance to see it before it opens. **Please note, foraging is only permitted on TLC properties under special circumstances and supervision of TLC staff. This property is not yet open to the public. The address is included with registration for privacy reasons. 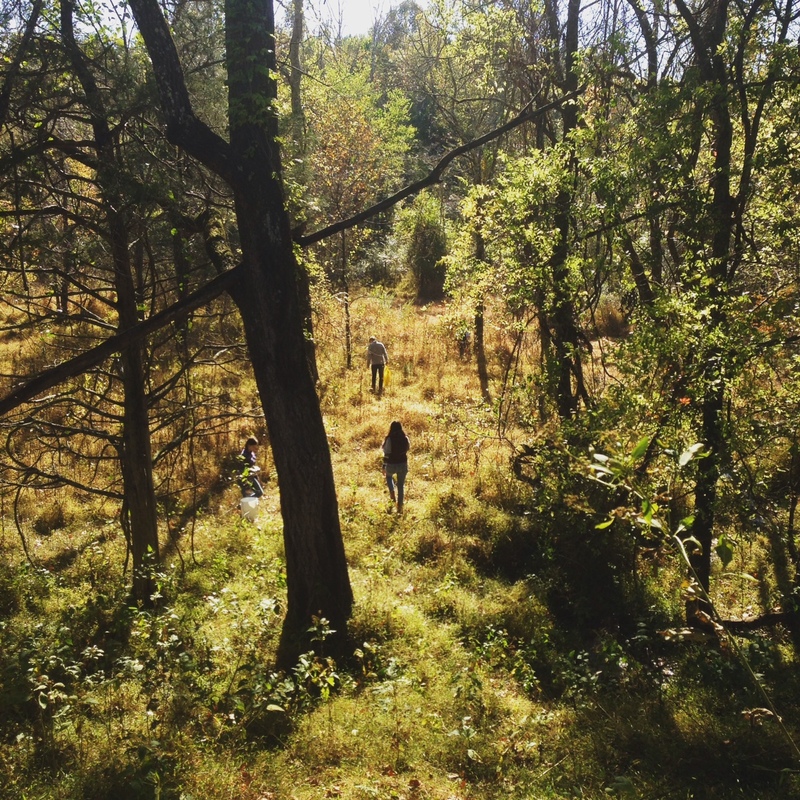 RESCHEDULED On October 2nd join Mystery Brewing Company, and Chatham Cider Works as we explore the wild edibles of White Pines Nature Preserve. 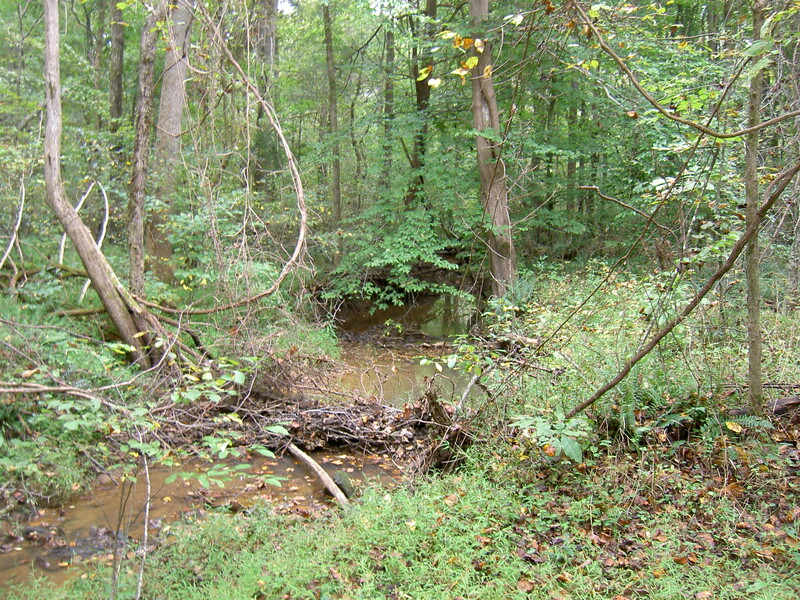 This 275 acre preserve in Chatham County was Triangle Land Conservancy’s first. Our founders agreed that the pre-historic micro-climate here with species usually only found in the mountains was worth conserving and sharing! For our 35th anniversary it got an update with new trails and a canoe launch. We are excited to partner with Abundance Healing Arts who will help guide the walk and provide plenty of information on plant identification and responsible, safe foraging practices**. “Planty” Kim Calhoun has been visiting White Pines for over 10 years and is excited to share her knowledge of its bounty with local beverage partners. 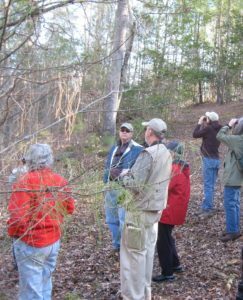 Join TLC for a guided hike at Horton Grove Nature Preserve in Durham County. 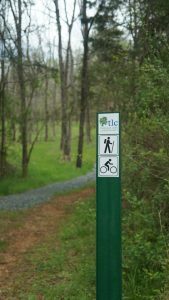 As part of TLC’s monthly nature walks, we will explore the trails from 10 am-12 pm. Families and pets (on leashes) are welcome. Please dress for the weather and wear sturdy footwear. We will meet at the gravel parking lot on the North end of the preserve at the start of the Holman Loop. Andrew and Sophie will be leading this walk and look forward to sharing Horton Grove Nature Preserve with you! 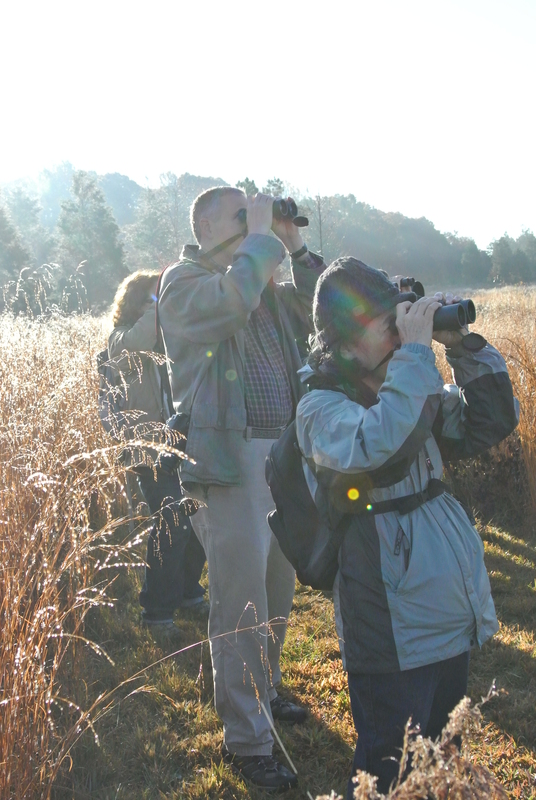 35 years ago, a dedicated group of volunteers founded Triangle Land Conservancy. Two years later White Pines Nature Preserve in Chatham County became their first major land purchase project when they bought 136 acres in 1987. Today, TLC has conserved nearly 19,000 acres, and opened 7 public nature preserves. 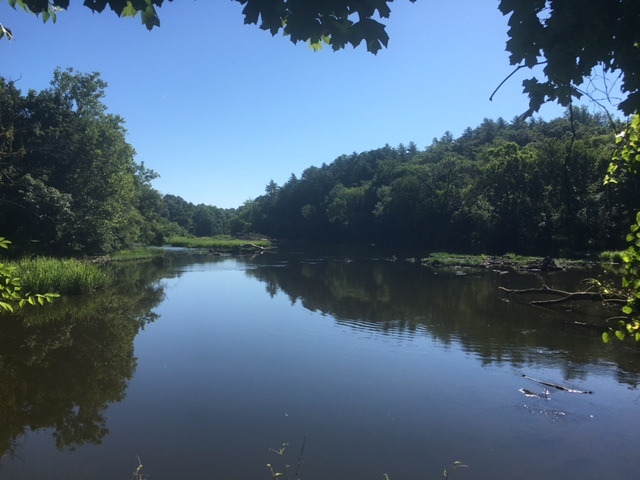 White Pines Nature Preserve is 270 acres now and just got an exciting update with additional trail miles and a canoe launch! 35 is a big birthday, let’s celebrate! 2 PM A White Pines Member Walk to tread the new trails added to this ancient microclimate. Meet the White Pine trees that inspired the name and the staff members who make trail building possible! Register below to participate. 4-6 PM A toast to TLC at the Lorax Lane Plant in Pittsboro with Chatham Ciderworks and Fair Game Beverage! Join us for refreshments, libations, updates about our work in Chatham County and our newly updated Strategic Action Plan. Click here to register. We hope all our hikers will come to Lorax Lane after their adventures, dress is very casual. We hope you can join us for the 2018 Annual Membership Day and celebrate all you have done to make the Triangle a healthier and more vibrant place to live! 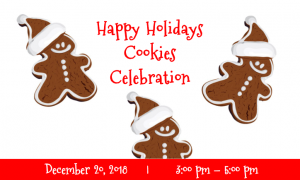 These events are exclusively for TLC members. Not yet a member? 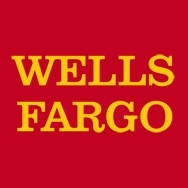 Click here to join and attend Membership Day and other events throughout the year. This event has reached its capacity. 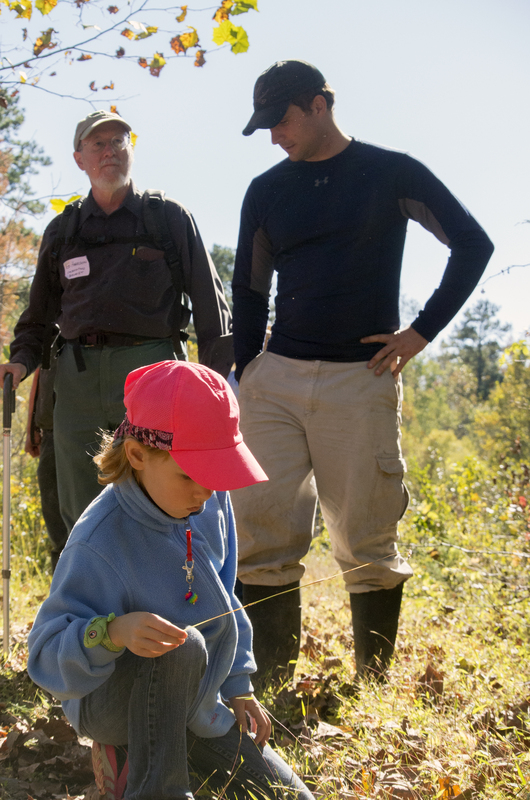 Our members are still at the core of what we do for the wild and working lands of the Triangle. You get the word out about land conservation, attend TLC events and bring your friends, champion conservation projects, and are our best ambassadors in the community. This year we are taking Membership Day back to Chatham County to thank you for all that you do and celebrate 35 years of improving lives through conservation! 2 PM A White Pines Member Walk to tread the new trails added to this ancient microclimate. Meet the White Pine trees that inspired the name and the staff members who make trail building possible! Click here to register. 4-6 PM A toast to TLC at the Lorax Lane Plant in Pittsboro with Chatham Ciderworks and Fair Game Beverage! Join us for refreshments, libations, updates about our work in Chatham County and our newly updated Strategic Action Plan. Please register below so we know how many to expect. We have ambitious goals for the next 7 years, including conserving 7,000 more acres in the Triangle and we hope you will help us achieve them. We also want to toast the last 35 years of conservation work that put nearly 19,000 acres under permanent protection. Bring your favorite TLC memories because we’ll be gathering your stories for our archives. We hope all our hikers and paddlers will come to Lorax Lane after their adventures, dress is very casual. Come join us for Halloween fun at Horton Grove Nature preserve! We are going to be exploring a TLC trail, playing Halloween themed games, and enjoying a treat while learning about some of the under appreciated animals we see a lot of this time of year. Feel free to come in your best costume! This is a free event but does require pre-registration. See below to register. This program is open to families with children ages 4 and up. Remember to dress for the weather, and to wear clothes that you don’t mind getting a bit dirty. Join us at White Pines Nature preserve for our monthly guided hike! 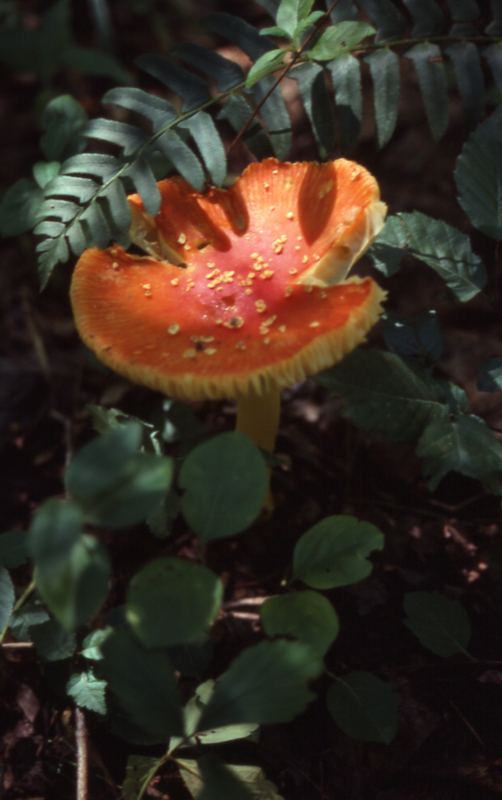 This month will be an introduction to different species of mushrooms that we find along the trail. 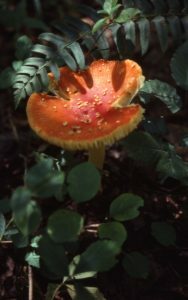 Learn tips and tricks for identifying mushrooms during your next hike, and enjoy starting your month off in nature. Please remember to wear comfortable shoes, and bring sunscreen, bug spray, and water with you. Leashed dogs are also welcome to join in the fun. This walk is for identification purposes only; foraging is not allowed on any TLC nature preserve. This is a free event but pre registration is required. See below to register. Come out on Saturday to walk the North side of Brumley and gather nuts for Fullsteam. We will use the service entrance to get closer to the trees, not the main public entrance. All foragers will get a wooden nickel good for a free beer at Fullsteam! Register below to join us on Saturday, November 3rd at Brumley Nature Preserve to go nuts for conservation! We’ll have two opportunities for foraging this year in hopes of an even bigger batch. So join us on Sunday at the Brumley service entrance to gather nuts for Fullsteam. We will use the service entrance to get closer to the trees, this is not a public entrance. All foragers will get a wooden nickel good for a free beer at Fullsteam! 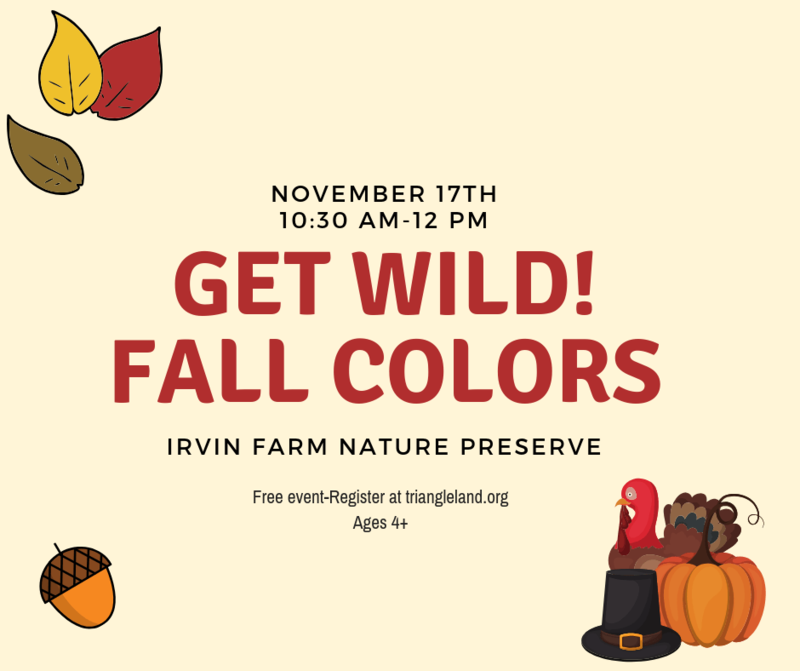 Register below to join us on Sunday, November 11th at Brumley Nature Preserve to go nuts for conservation! Join TLC at Irvin Nature Preserve for a morning of family fun celebrating the fall season. We’ll learn about why leaves change color while looking for some of our own to use for seasonal crafts! This is a free event but does require pre registration. See below to register. Opt Outside on Black Friday with REI and TLC! Skip the long lines and walk off your Thanksgiving dinner at Horton Grove Nature Preserve on November 23rd at 1 PM. TLC staff members Melissa Kennedy and Deja Smith will lead this moderately paced hike around our beautiful preserve, giving you the chance to see a variety of native habitats and the wildlife that lives there! 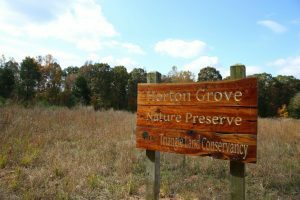 Come for your first introduction to Horton Grove Nature Preserve or to learn something new about one of your favorite places, with over 8 miles of trail there’s lots to explore at Horton Grove Nature Preserve on November 23rd and every day! 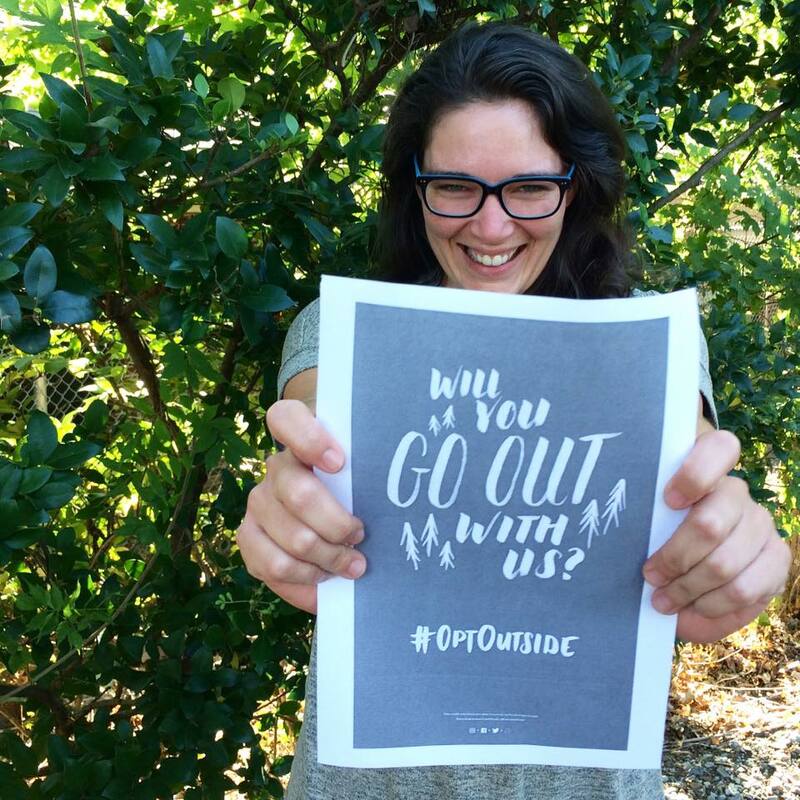 Join the #OptOutside movement with us. 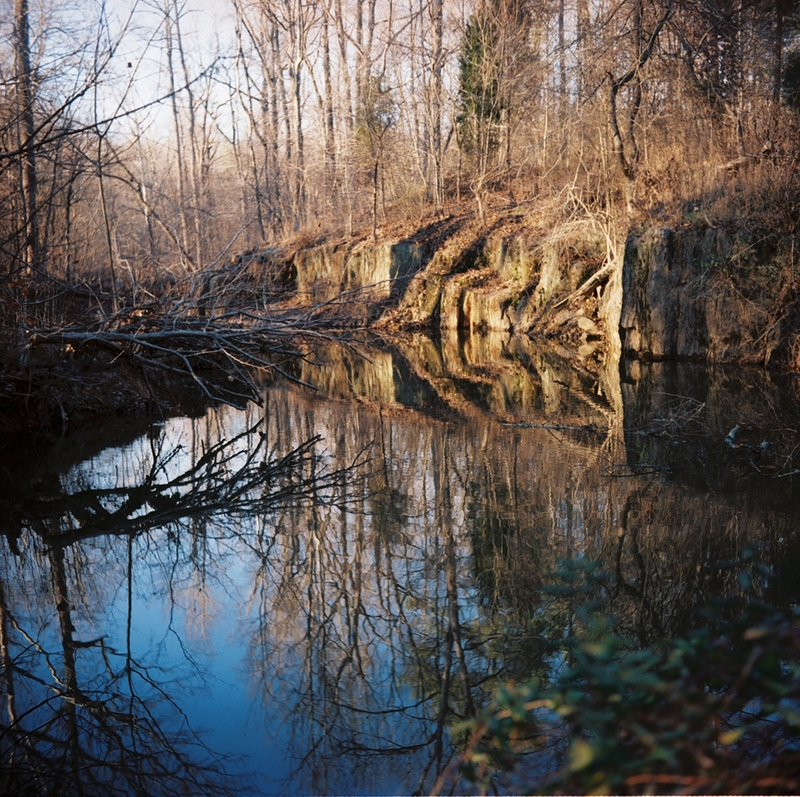 Start your December off with a guided hike at beautiful Johnston Mill Nature Preserve. 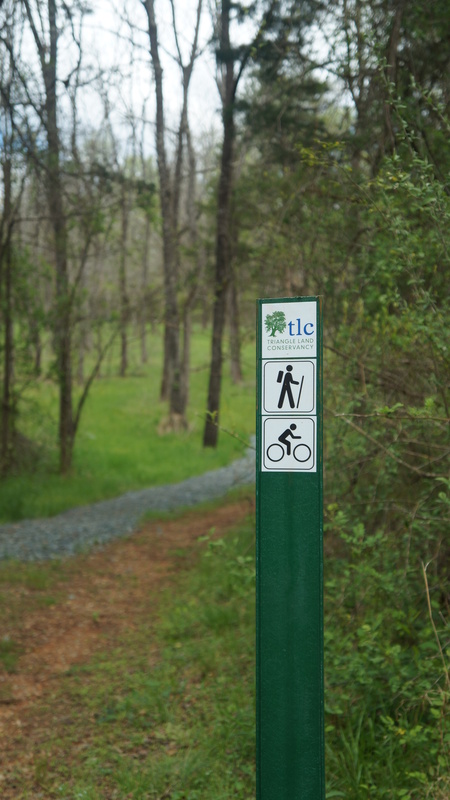 As part of TLC’s monthly nature walks, we will explore the trails from 10:30 am-12:30 pm. Families and pets (on leashes) are welcome. Please dress for the weather and wear sturdy footwear. 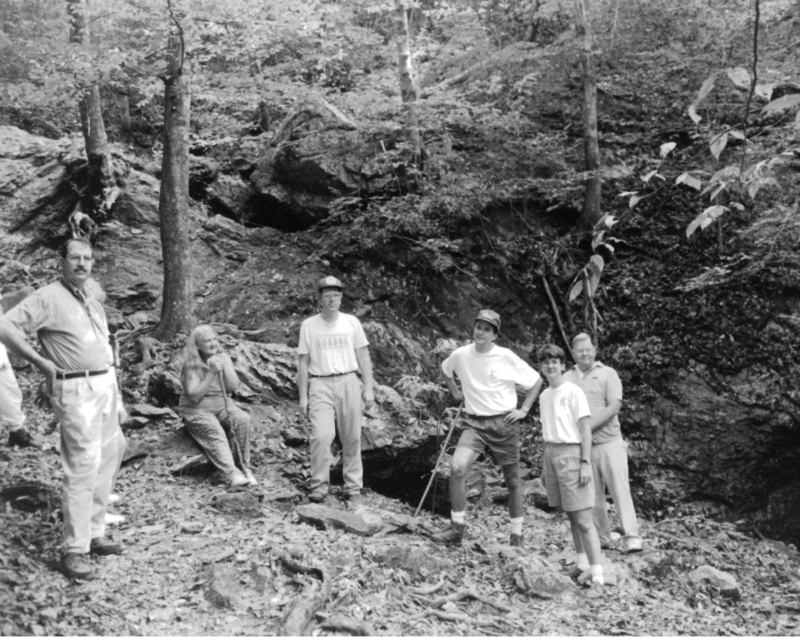 In 1983, an ambitious group of volunteers founded Triangle Land Conservancy to conserve land for tomorrow. 35 years later, TLC has protected over 18,500 acres in Chatham, Durham, Johnston, Lee, Orange, and Wake Counties. We’ve opened 7 public nature preserves where people can connect with nature on their own or during one of our 60+ events per year. We manage 3 farm properties where partners are given the land they need to grow food for their communities. But are we ready for the next 35 years? For more information on Wild Ideas for Tomorrow, Today speakers, schedule, and Expo organizations please visit the Wild Ideas homepage. 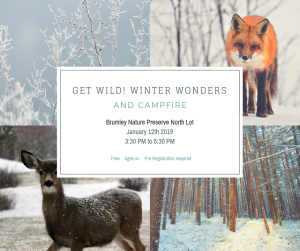 Triangle Land Conservancy invites its members to Brumley Forest Nature Preserve to celebrate the coming of winter! On Sunday December 9th we will gather by the pond for festivities by a fire. Enjoy forest inspired foods, sip on hot cider with TLC members and staff as we watch the seasons change at this special property. This event is for TLC members only. Not a TLC member? Join today for just $35 or more and embrace all TLC has to offer! 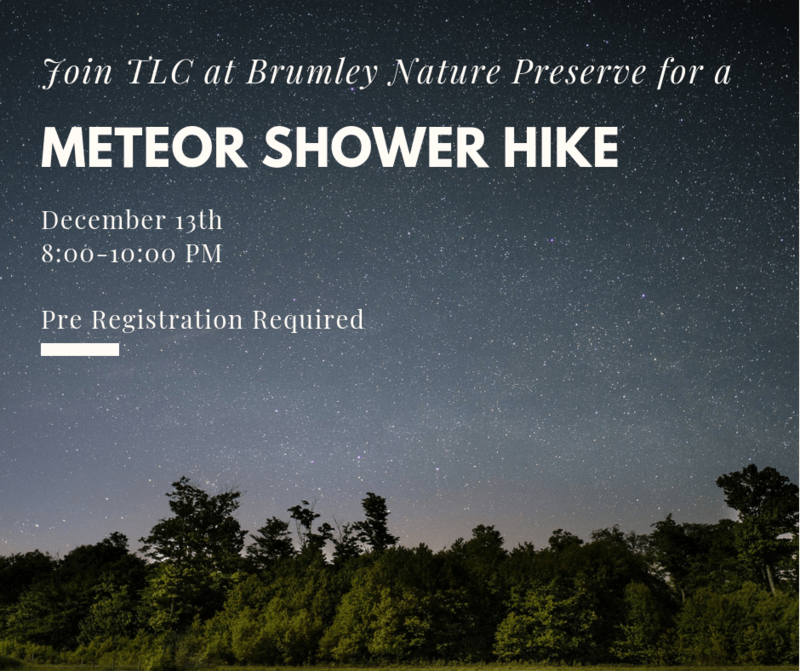 Join TLC at Brumley Nature Preserve for a night hike to see the Geminid meteor shower! It is supposed to be the brightest meteor shower of the year, with up to 100 meteors per hour. We will hike with headlamps and flashlights down to an open area of the preserve in order to have the best view. Bring a chair or tarp to sit on, and dress warmly! We will use the main entrance off of New Hope Church Rd. We are having a meeting for the Walnut Hill Advisory Committee to continue moving forward with plans for our newest preserve. We will be presenting the Regenerative Design Groups draft of the plan for Walnut Hill, followed by discussion and feedback. Holiday refreshments will be provided. 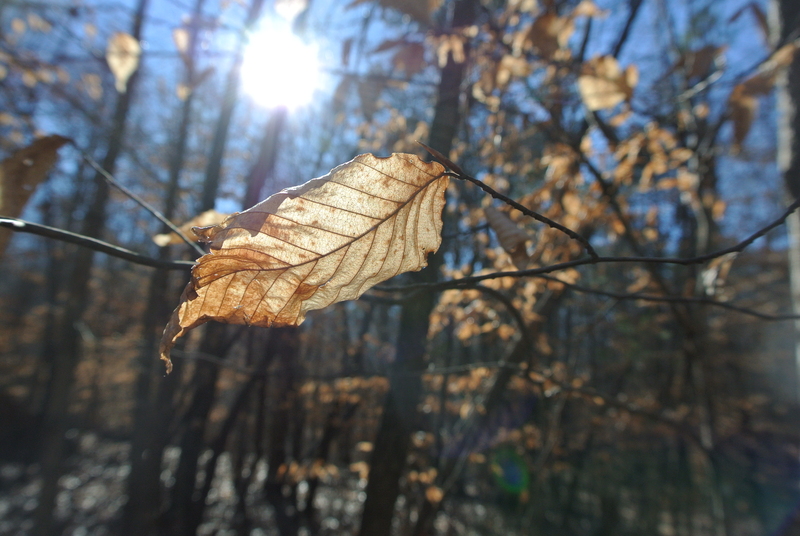 Join us at White Pines Nature preserve for our monthly guided hike, and the first TLC hike of the new year! Explore some of the new trail systems built and view the beautiful Deep and Rocky rivers. White Pines provides habitat for a wide variety of animals, and winter results in some beautiful seasonal changes in this habitat. Kick off 2019 outdoors with us! Join TLC for this family event about how some mammals and reptiles brave the cold conditions of winter. 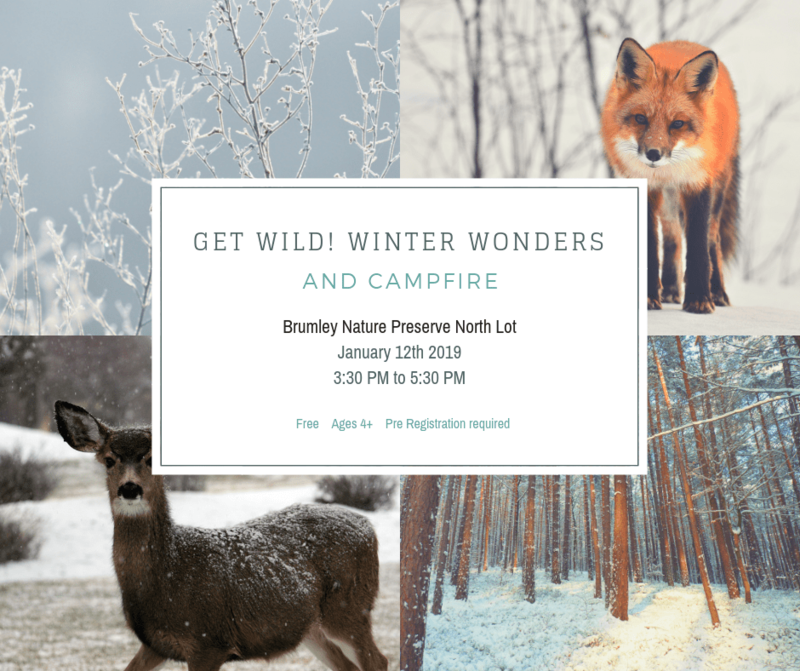 We will learn about how beavers, snakes, and other animals found at Brumley Nature Preserve are able to survive low temperatures and food shortages through games and activities. Finish it off with one of our favorite winter adaptations- a campfire with s’mores! Please dress for the weather, and wear closed-toed shoes. 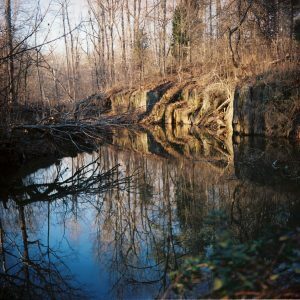 Explore one of seven Wake Wonders on the first Saturday of February at TLC’s Swift Creek Bluffs Nature Preserve. 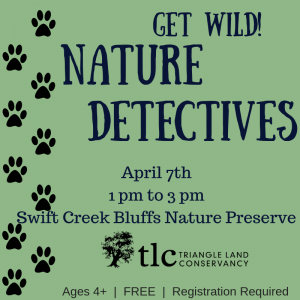 This guided hike will take us all throughout Swift Creek Bluffs, giving us the chance to see the entirety of this small yet beautiful preserve which is a gem in the midst of Raleigh development. The hike will take us on the Stairway to Heaven in order to scale the bluffs for a wonderful view, but it is a bit challenging so plan accordingly. The free hike will begin at 10:30 am from the main parking area. Please bring water and dress according to the weather. Leashed pets are welcome. There are no bathrooms available at Swift Creek Bluffs. Beers from Here is a collaboration between local beverage producers and Triangle Land Conservancy to celebrate the lands behind local flavor. This past fall, local brewers participated in foraging walks* on TLC preserves to gather knowledge and appreciation for edible native plants. Join us February 7th at State of Beer to try five beers and two ciders inspired by the walks on our preserves. The event will feature beer and cider from Trophy Brewing, Fullsteam Brewery, Dirty Bull Brewing Company, Steel String Brewery, Starpoint Brewing, Chatham Cider Works, and Botanist and Barrel. *Please note, foraging is only permitted on TLC properties under special circumstances and supervision of TLC staff. Join us February 8th at Steel String to try five beers and two ciders inspired by the walks on our preserves. Join us on February 10th at Beer Study to try five beers and two ciders inspired by the walks on our preserves. Join Appalachian Mountain Brewery, The Longleaf Alliance, and Triangle Land Conservancy for a volunteer work day and event at Walnut Hill, the future 405-acre nature preserve in Southern Wake County! 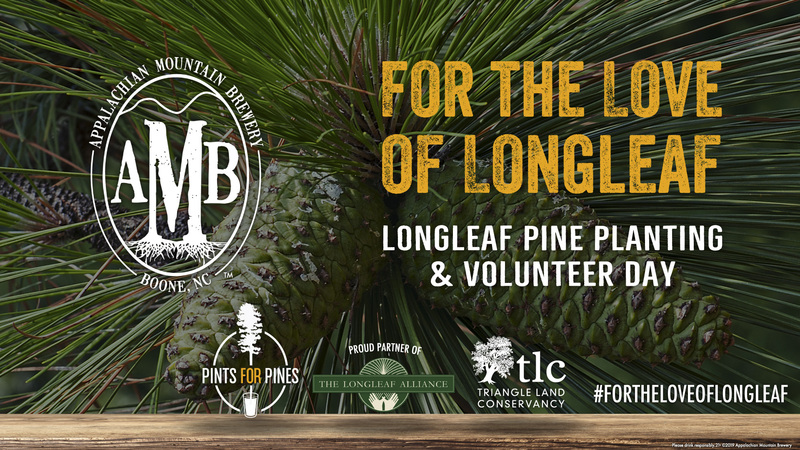 The tree planting ceremony kicks off the ‘Pints for Pines’ program in 2019, through which the Boone-based brewery will plant one longleaf pine seedling for every case of flagship Long Leaf IPA sold during the year. Based on sales from 2018, AMB and the Long Leaf Alliance will plant 40,000 seedlings across North Carolina, South Carolina, and Tennessee—communities where AMB beer is sold. 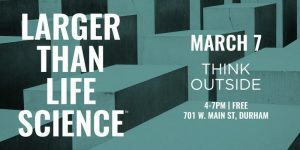 After the planting, stick around for a Thank You Happy Hour at Morgan Street Food Hall! Register to help out here. 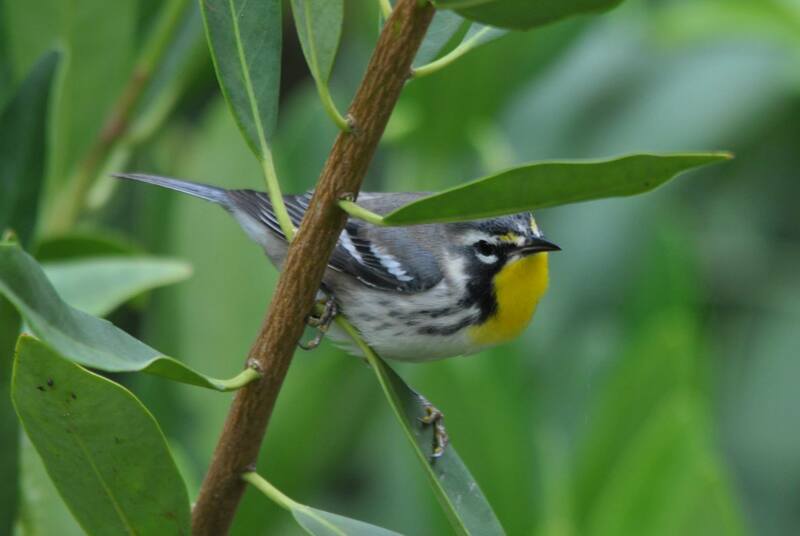 Since 1998, The Great Backyard Bird Count has been collecting citizen science data on birds. This project has been a staple for the Cornell Lab of Ornithology and National Audubon Society by involving over 100,000 people across 100 different countries resulting in more than 6,200 species counted from over 151,500 check lists in 2017. The data they collect looks at the distribution and abundance of bird species, and the changes from year to year. Most people who take part will spend more than 15 minutes either watching a bird feeder or counting what they see from their home. Please note that each of these dates has a separate registration page. Unable to attend, but still want to participate? Visit The Great Backyard Bird Count Webpage for more information. This event has been cancelled due to weather. The forest at Johnston Mill is home to lots of our feathered friends. Winter is a good time to look for birds, because many migrate down to North Carolina for our milder winters. In this program we will talk about some of the birds you can find right in your backyard, and even look for some ourselves on a short nature walk! We’ll finish by making our own bird craft to take home. We will meet at the Mt. Sinai entrance of Johnston Mill. This program is open to families ages 4 and up. If you have binoculars feel free to bring them, but they are not required. Remember to dress for the weather and wear clothes that you don’t mind getting a bit dirty. Due to low registration the February 17th event has been cancelled. 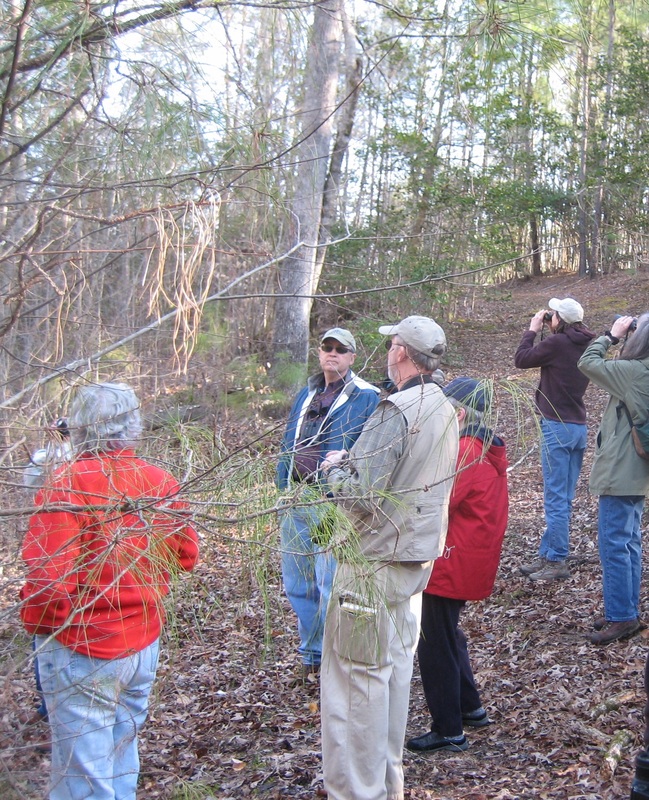 Join TLC for a guided hike at Horton Grove Nature Preserve in Durham County. As part of TLC’s monthly nature walks, we will explore the trails from 12 pm to 2 pm. Families and pets (on leashes) are welcome. Please dress for the weather and wear sturdy footwear. There are no bathroom facilities so please plan accordingly. We will meet at the gravel parking lot on the North end of the preserve at the start of the Holman Loop. If you are interested in leading or helping with your own TLC hike in the future, register here for our Hike leader/host training which will take place right before this First Saturday hike! 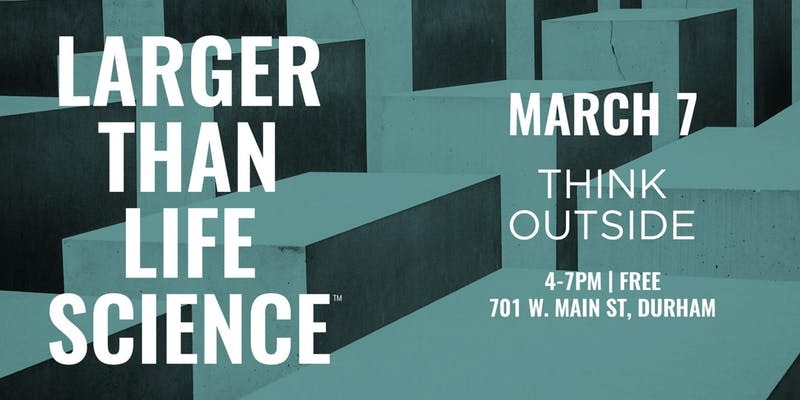 Join us March 7th for LaunchBio’s monthly lecture series, Larger than Life Science! Come stop by and learn about all the ways we are protecting clean drinking water in the Triangle, fun activities to do while visiting the preserves, upcoming volunteer opportunities, and special events we hold, like foraging for nuts and berries with local breweries, For the Love of Longleaf, and Wild Ideas. We will be providing samples of beer and cider from the Beers from Here series. Join Triangle Land Conservancy’s monthly family series to meet some critters that call creeks their home! This Get Wild! is special because it kicks off Durham’s Creek Week 2019. 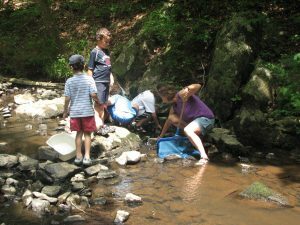 Creek Week is a community effort by 20+ partners working together to provide opportunities for Durham residents to discover and explore local streams, and to do their part to protect water resources. There are events all over Durham from March 16th to March 23rd. Get your Creek Week passport stamped at Get Wild! for the chance to win a $100 certificate to Frog Hollow Outdoors. This event is geared towards families with kids ages 4-6 but is open to everyone. We will take a short nature walk down to a creek and discover some aquatic creatures firsthand, then finish with a take home craft. We will meet at the gravel parking lot on the North end of Horton Grove at the start of the Holman Loop. Please wear clothes you don’t mind getting wet or dirty, and get ready for a fun afternoon! This is a free event but does require pre registration. See below to register. 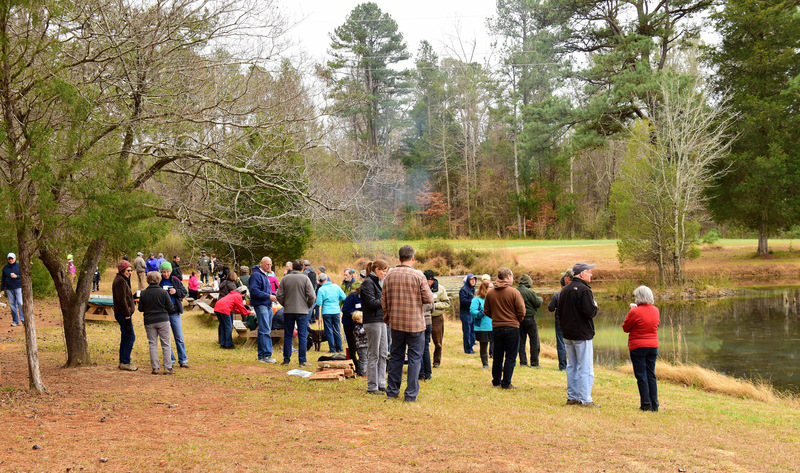 March 16th-23rd is Durham’s Creek Week 2019! Creek Week is a community effort by 20+ partners working together to provide opportunities for Durham residents to discover and explore local streams, and to do their part to protect water resources. 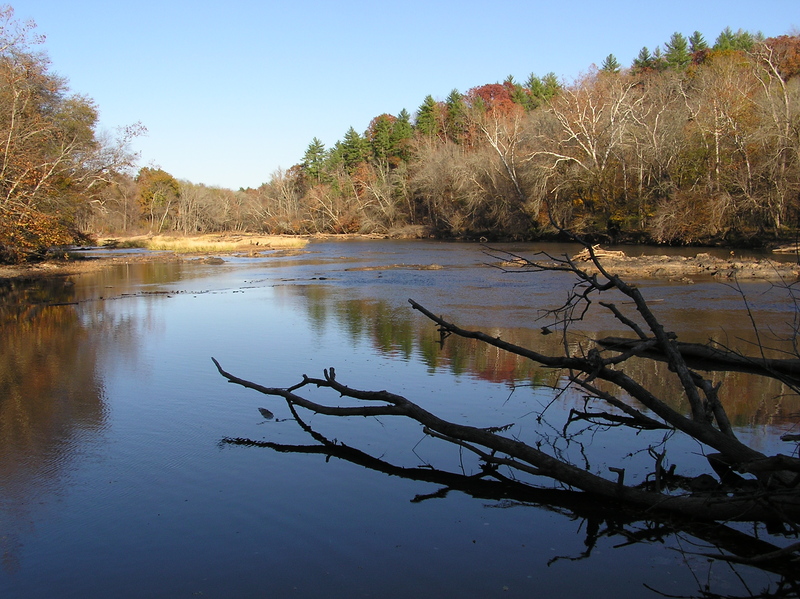 Although Brumley Nature Preserve is in Chapel Hill, the water there is equally important and flows through Durham from Stony Creek to the Eno River and into Falls Lake. The Eno River provides significant recreation use and wildlife habitat for Durham, and Falls lake provides drinking water to much of Raleigh. Every clean drop counts! Kick off Creek Week with a sunrise flow led by TLC staff member/yoga teacher-to-be Casey, and fellow yoga teacher Chelsea Mackin. They are taking courses at Blue Point Yoga Center through the Yoga Alliance certification program. Get inspired by and in tune with the nature around you to fully immerse yourself in the meaning behind Creek Week! Casey and Chelsea will lead us in this practice next to Brumley pond for a beautiful and peaceful setting. All levels are welcome, please bring a beach towel and mat if you have one. Don’t forget to bring your Creek Week passport and get it stamped for the chance to earn a $100 certificate to Frog Hollow Outdoors. This is a free event but pre registration is required. Enjoy a spring morning at Brumley Nature Preserve! TLC volunteer hike leaders will guide us on this exploratory hike through our most visited preserve. Haven’t logged a hike for TLC’s Hiking Challenge yet? Make this your first one! Leashed dogs are welcome to join. This is a free event but pre registration is required. Do you have what it takes to be a Nature Detective? 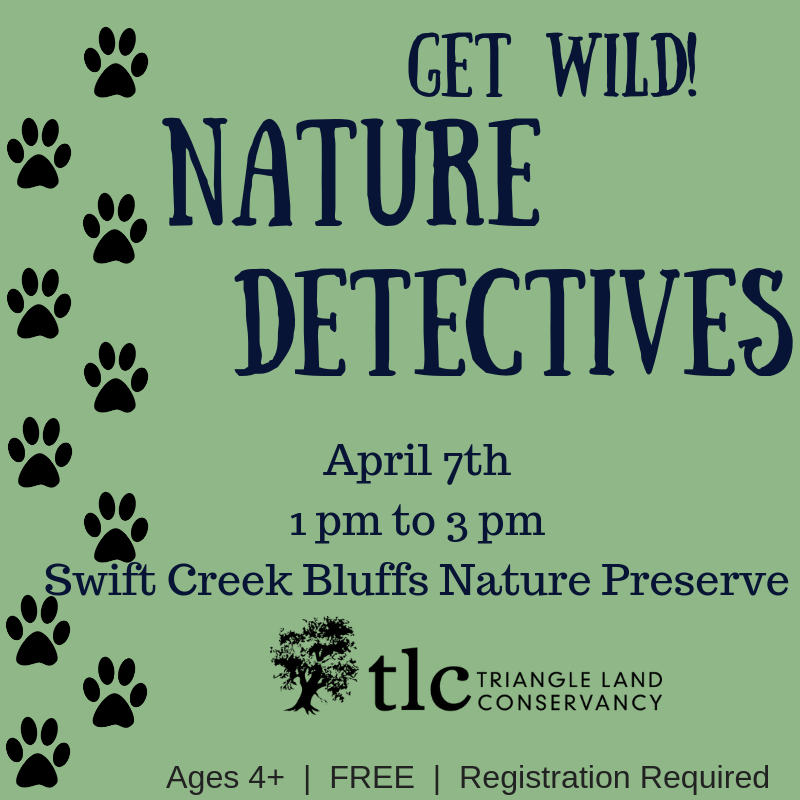 Join us at Swift Creek Bluffs Nature Preserve to find out – we’ll be learning how to spot local critters through tracks, sounds, and other signs. After some practice, we’ll head out on an animal tracking adventure! We’ll also make animal tracks of our own to take home. 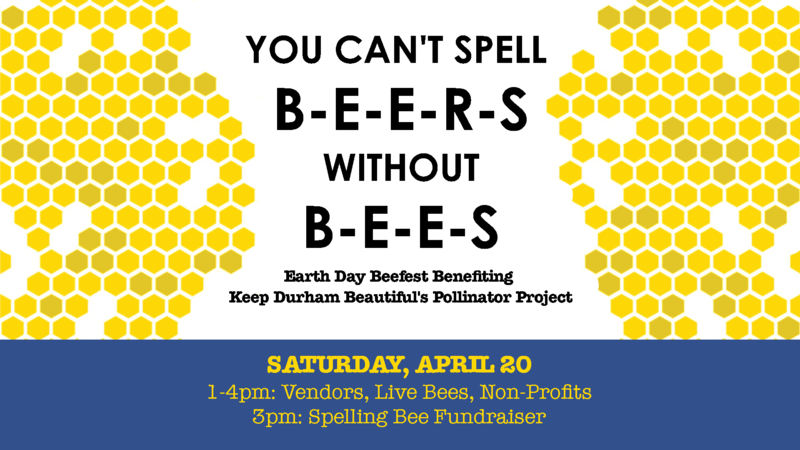 Celebrate Earth Day at Fullsteam Brewery’s You Can’t Spell BEERS without BEES event! We’ll be one of eight local vendors and non-profits with booths featuring live bees, bee-related products (mead, honey, & more! ), seeds, and other educational tools. The highlight of the event is a Spelling Bee at 3pm where audience members can buy extra lives to keep their favorite contestant in the game. The winner will get a “Honey Pot” of pollinator goodies. 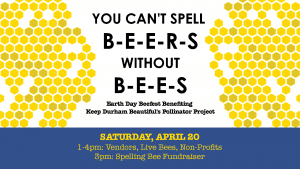 All proceeds from the contest go to Keep Durham Beautiful’s Pollinator Project, so come have a few beers and support this great cause! If you can’t make it to the event, you can still donate in advance on Keep Durham Beautiful’s site. Check out more event details and RSVP here.